Marcus Maddison is out of the Posh trip to Chesterfield. 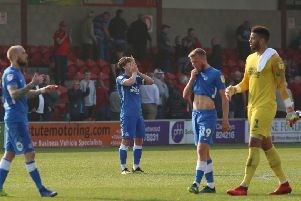 Peterborough United manager Grant McCann insists his side will emerge from their dreadful run of form as a much stronger outfit. Posh head to Chesterfield for a League One fixture tonight (March 14) on a dreadful run of four wins and nine defeats in their last 13 matches. The defeat at home to Oxford on Saturday (March 11) was a third in succession - and that hadn’t previously happened all season. Michael Smith faces a race to be fit for the Posh game at Chesterfield. Posh remain in touching distance of the play-off places - they are eight points behind sixth placed Millwall who have two matches in hand - but it would take a remarkable turnaround in performance levels for McCann’s men to extend their season beyond April 30. “You have to get through the bad times to enjoy the good times,” McCann said. “All we have been through in this bad run will stand us in good stead for next season and the season beyond that. “At the moment very little going for us, but I have never quit on anything in my life and I will make sure my players don’t give up either. “We have lost the last three games so now we need to make sure we win the next three. If we can do that we will then have a look at where it has taken us. Paul Taylor was superb for Posh against Oxford. “What I do know is our poor form since January has made me doubly determined to make this club successful again. “Criticism has been flying around, but if you can’t take criticism you shouldn’t be in football. Everyone has an opinion these days. “There is no need to throw your toys out of the pram. We have nine games left and we have to approach every one of them in a positive fashion. “It should be a decent game at Chesterfield. They have changed the way they play since Gary Caldwell took over and he showed last season with Wigan what a good manager he is. Posh will be without attacking talisman Marcus Maddison because of an ankle injury, but right-back Michael Smith will be given every opportunity to recover from a dead leg. Teenage midfielder Leo da Silva Lopes will miss the match because of suspension. Brad Inman, Anthony Grant and Martin Samuelsen are the man in with a chance of replacing him. Maddison’s absence could be an irrelevance if Paul Taylor repeats his weekend form. “Taylor was oustanding against Oxford,” McCann added. “Between the penalty areas he was different class. In that sort of form he is hard to stop.